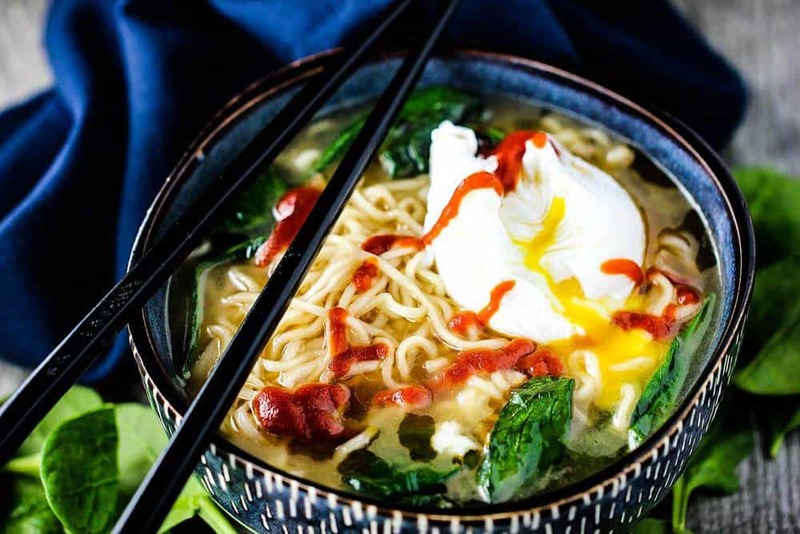 Spinach Ramen Noodle Soup with Poached Egg is one of our most favorite Asian-inspired soups in the world. Back in our college days, Wesley and I (even before we met), practically lived on Ramen noodles. They were cheap, easy to buy in bulk…and we actually thought they were quite tasty! For this recipe, there’s no need to open up the included seasoning packet in the ramen noodles package. 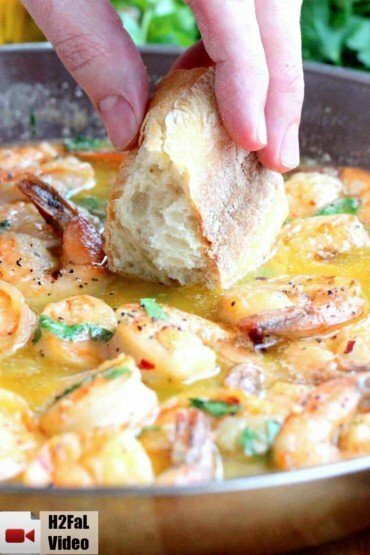 They are loaded with sodium, and not what’s needed for this fantastic recipe. 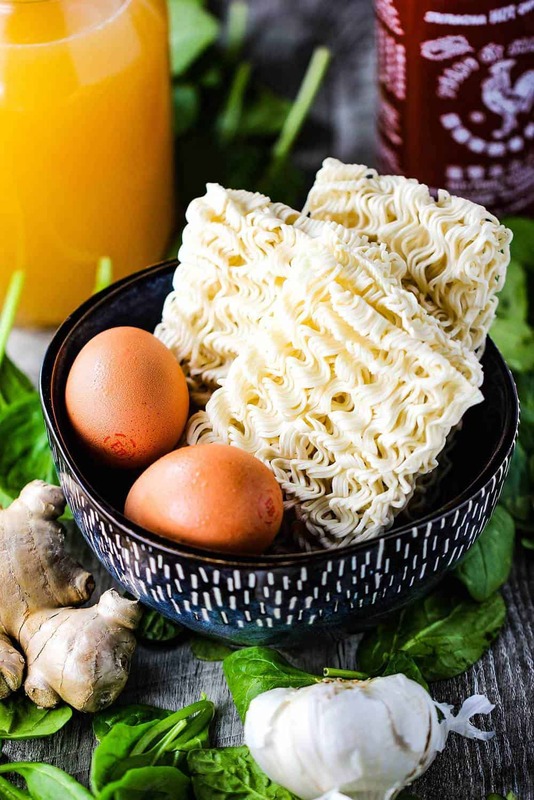 The ingredients for this Spinach Ramen Noodle Soup with Poached Egg are simple and work together beautifully. Ginger, garlic, spinach and poached egg. Perfection. But don’t forget to garnish with sesame oil and Sriracha…it truly brings the taste home. 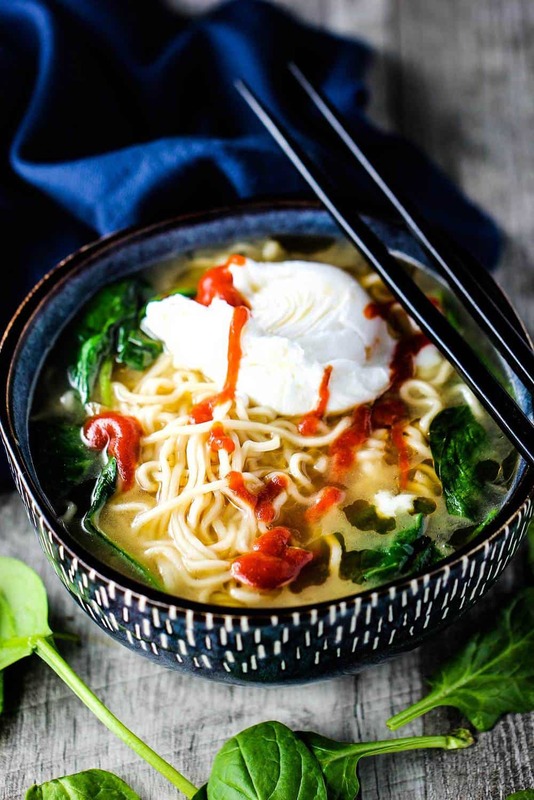 This Spinach Ramen Noodle Soup with Poached Egg is literally ready in about 20 minutes, tops. Use good quality chicken stock for a wonderful depth in flavor. The noodles cook in about 5 minutes. Next, comes the baby spinach. Yeah, baby…spinach. 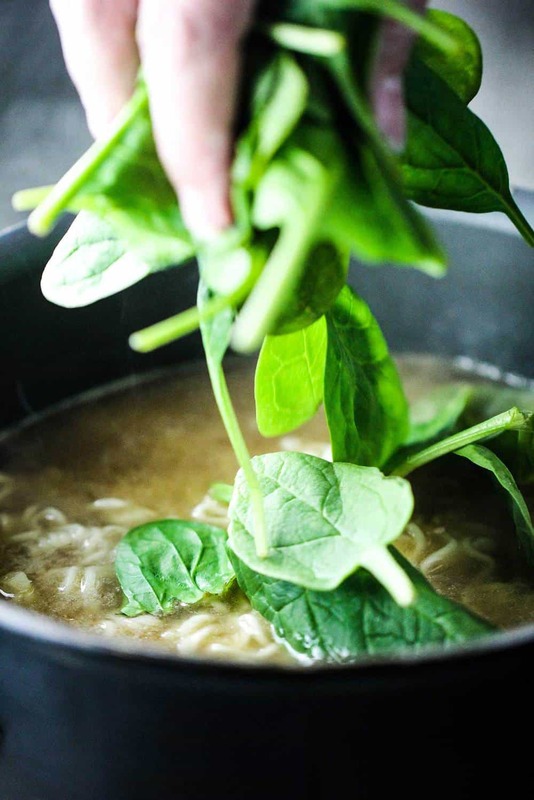 The leafy greens are the perfect match with the noodles and flavorful broth. You can just drop an egg (or two) into the hot soup, cover for a few minutes, and you’ll have a nicely poached egg. Alternatively, we love to take a separate pot of boiling water and use the vortex method. Simply plunge the handle of a wooden, or metal, spoon into the boiling water and spin around to create a spinning vortex. 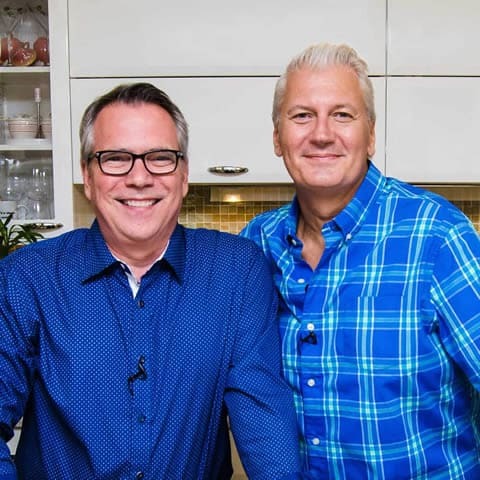 Crack the eggs into a small container, then add a drop of distilled white vinegar on top, and then gently drop the egg(s) into the spinning boiling water. Immediately turn off the heat, and then wait for 3 to 4 minutes. 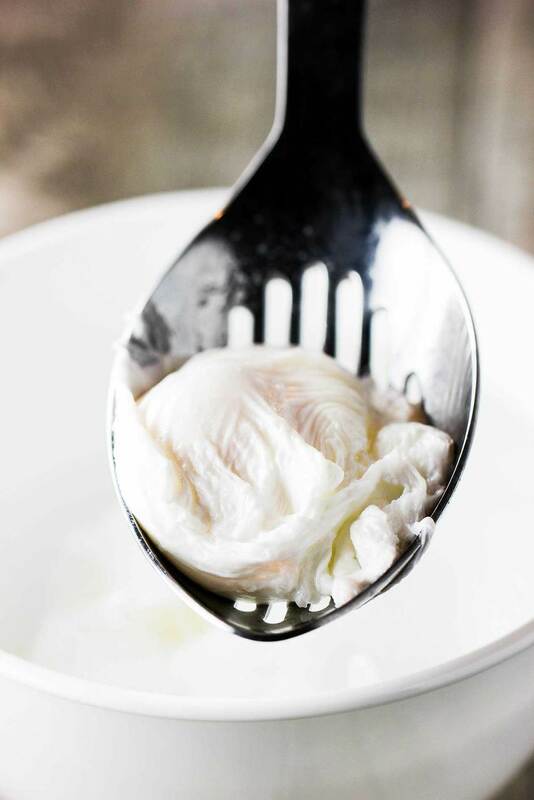 Use a slotted spoon to gently remove the beautifully poached egg. Then, carefully add the egg to your bowl of Spinach Ramen Noodle Soup. We love this soup for so many reasons. First and foremost is the taste. It is just so delicious. But, it’s also very fast to prepare, healthy, and easy on the wallet. 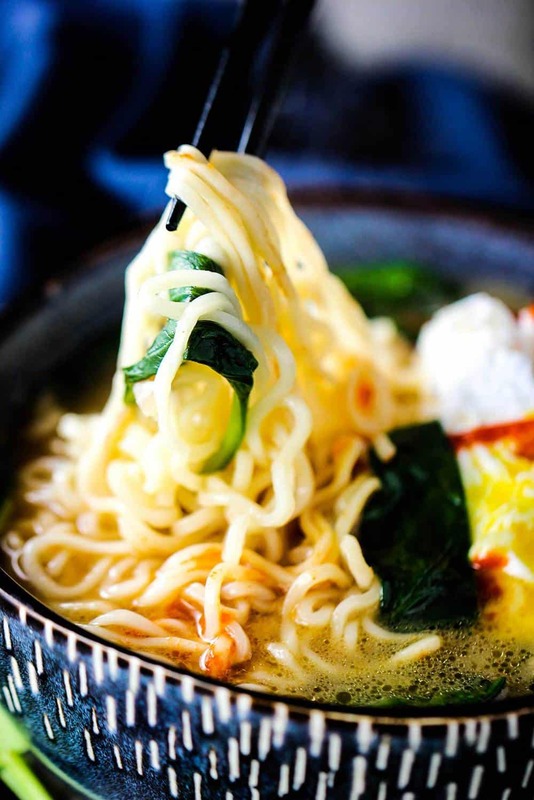 This Spinach Ramen Noodle Soup with Poached Egg is as nostalgic as it is current. We can’t help but think of our budget and culinary-challenged college days of eating ramen noodle soup. There really was something satisfying about it, even then. But, updating this simple bowl of goodness to culinary excellence is really something to celebrate. In all of about 15 to 20 minutes! 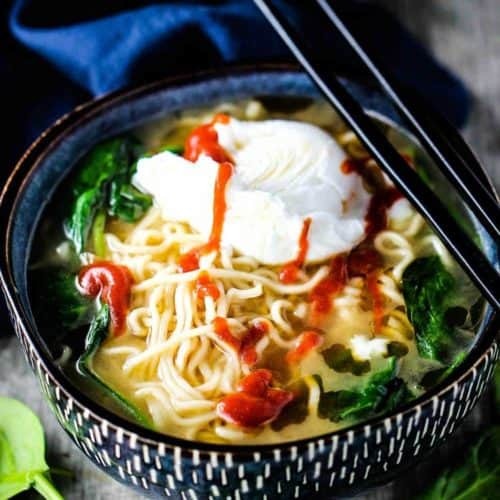 This Spinach-Ramen Noodle Soup with Poached Egg is amazingly flavorful and comes together wonderfully with sauteed garlic and ginger, fresh spinach and ramen noodles...topped with a poached egg, sesame oil and a few splashes Sriracha sauce! Yum yum yum! In a medium-sized skillet or pot, heat the oil over medium heat. Add the onion and cook until translucent, about 4 minutes. Add the garlic and ginger and cook for another 2 minutes. Add the ramen noodles and cook, stirring to break them apart, until they are tender, about 6 minutes (test one to make sure they are cooked to your liking). Lower the heat to medium and add the spinach and cook until wilted, about another minute. Crack 2 large eggs into the pot, cover, and turn off the heat. Let sit until the whites have set, about three minutes. (Or, you can poach the eggs in boiling water for three minutes...remove, and then add to the soup). Divide between 2 bowls and top with a drizzle of sesame oil and a few dashes of Sriracha sauce. Ramen is a great thing! I made this for myself tonight and have leftovers for lunch tomorrow. Only things I did different were lessened the broth by a cup, used ” grown-up” spinach leaves and added mushrooms & tiny broccoli flowerets. 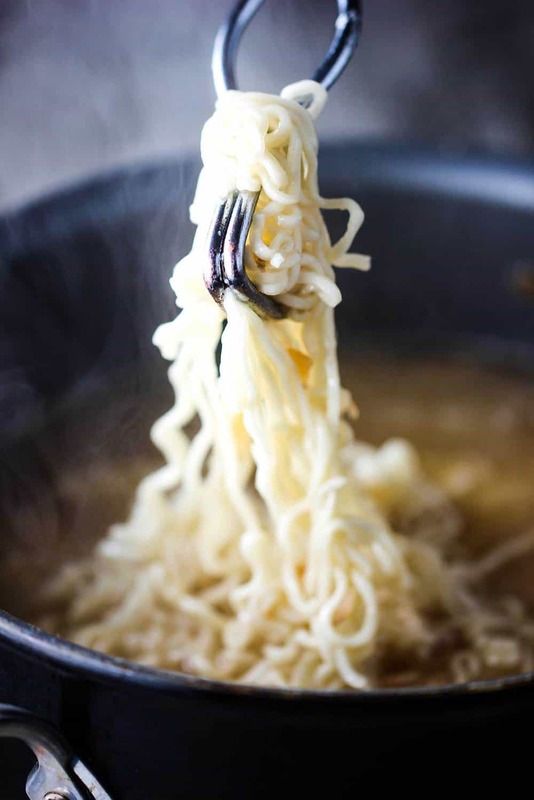 Ramen is one of those foods that take just about any additions.